The Nova single tote bag from BSI has a retro shape with modern materials in a variety of colors. This is a great bag for someone just getting into the sport or a seasoned bowler who has too many balls for their roller bag. Hey Susie. The BSI Nova Single Tote will store a small size pair of shoes. Can this slide on to a roller bag handle? Is it an “add a ball” design? Hello Jay. This is a single tote, it could slide over the handles if you wanted it to but it is not an add a bag. How large a shoe does bag hold along with balls I wear any wear from 9-10 in ladies shoes. It will fit a small pair of shoes. 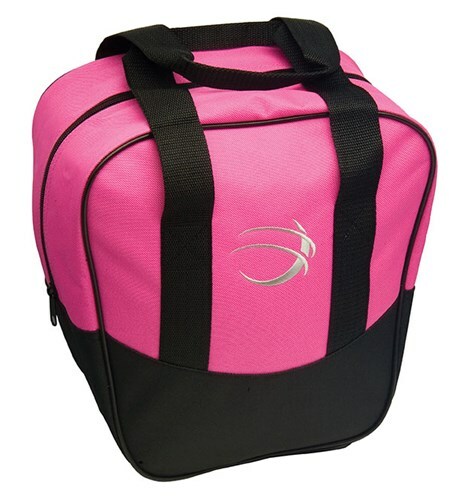 Due to the time it takes to produce the BSI Nova Single Tote Pink/Black ball it will ship in immediately. We cannot ship this ball outside the United States.